"Middlesbrough Boy First to be Awarded One"
I was born and raised in Middlesbrough only a couple of streets away from where Arthur Shepherd resided and feel quite honoured knowing that the first recipient of the "Cornwell Badge" was not only someone from Middlesbrough but that the award was made as a result of his courageous duty throughout the loss of the hospital ship! It is therefore only right that his courage and conviction to his responsibilities is honoured on my website for all to see. Of the many awards which Scouts can be awarded with, there is one above all that is rarely attained. The Cornwell Badge or "C" badge, although devoid of lavish embellishments is one that will always remain a most treasured prize. It was instituted in memory of the boy hero John Travers Cornwell and anyone being considered for the award must have shown or possessed the following attributes. a) Hold an award for bravery for having saved life under exceptional circumstances. b) Have undergone suffering in a heroic manner. 2. Must be a First Class Scout. e) Smartness in bearing, kit, and appearance. 4. Must have passed the Missioners Badge. Boatman, Pilot, Sea Fisherman, Signaller, Starman, Swimmer or Rescuer, Watchman, or must have the Public Service Coast Watching Badge, that is to have been on coastguard duty at least 100 days. The severity of the test makes the feat all the more meritorious, and the people of Middlesbrough will learn with pride that one of her sons, Patrol Leader Arthur Shepherd, of the 8th Troop and who resided at 163, Union Street, has had the distinction of being the first to win the award, which was personally presented to him by the Chief Scout General Sir R. Baden Powell, at a meeting of lads. Leader Shepherd displayed splendid courage on more than one occasion, he was on coastguard duty at Whitby at the time the Rohilla was wrecked. The Scouts turned out in the early hours of the morning, and on their own initiative made a fire and coffee. For two or three days and nights they were on the scene, assisting in the work of rescue, displaying great gallantry, for which they were highly commended by the Admiralty. Their duty necessitated their traversing dangerous cliffs during the height of the gale, when the slightest slip would have been fatal, but they did the work right well. The recipient was also at Whitby when the Coastguard Station was shelled by German vessels and showed the greatest pluck and coolness. As the Chief Scout remarked "Middlesbrough has good reason to be proud of Patrol Leader Shepherd." "I must have a Badge for courage," I said to Mr. West at Headquarters a few weeks ago. "I'm sorry Mr Elwes," Mr West replied "but they are not for grown up officers. "Oh, it's not for myself," I replied, laughing, I am sure I should never be entitled to one, but it's like this. The Chief is going up to Middlesbrough tomorrow to address a mass meeting of boys in connection with the National Mission. He has promised me that, before the meeting, he will examine Patrol Leader Shepherd of the 8th Middlesbrough Troop. Shepherd holds the First Class, Missioner's and Coast Watching, badges, and the character report from his Scoutmaster, schoolmaster, and employer are excellent The only question now is as to the test of courage. The accounts I have received of what he did at Whitby are fine, and I think the Chief will be satisfied when he has had a talk with the boy and his Scoutmaster, so I have got an idea. If only you will produce a badge, Mr. West, we will hand it to the Chief, then if he thinks fit he can present the badge at that great meeting of boys. There was only one badge in existence at that time, the sample one, and it had been sent back to the makers, but Mr.West rose with energy to my idea - the sample badge was recovered in time from the makers and delivered to the Chief, and so it came about that, on the following evening, at a meeting of 3,000 boys with the Archbishop of York in the chair the Chief presented Patrol Leader Shepherd with the first Cornwell Badge of courage. "And how those 3,000 boys cheered," said the Chief to me next day. "I believe every one of them wished he was a Scout." The photograph above was taken in 1994 of the actual photograph presented by B P to Arthur Shepherd. The frame holds the First Cornwell Badge itself along with Arthur's War Service Coast Watching Badge. When the "Rohilla" was wrecked on the rocks at Whitby (in 1914), Leader Shepherd was on coast watching duty there with the Patrol. The Scouts turned out with the coastguard's in the dark early hours one morning, and they were hard at work, with only short intervals for rest, for the following three days and nights, wet through with a gale blowing, trying to rescue drowning men and recovering bodies. 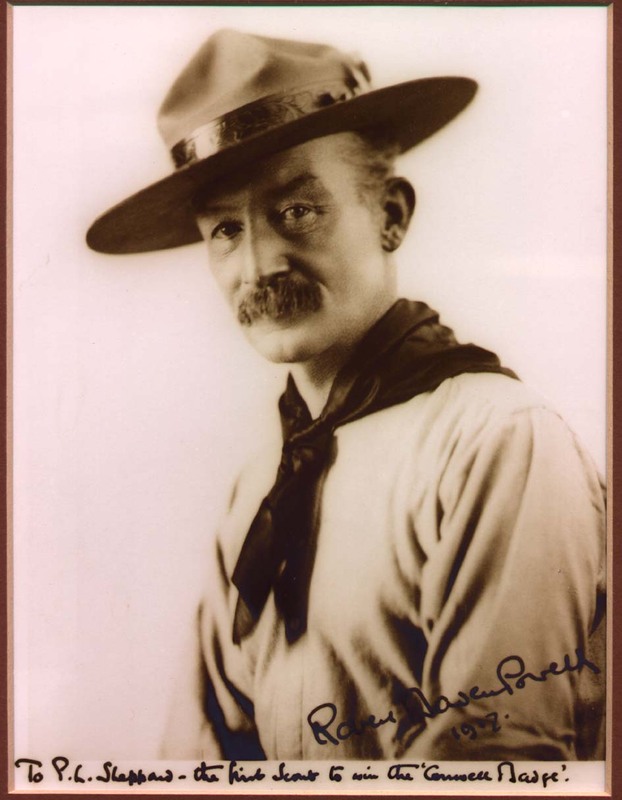 At one time the Scouts waded into the surf with a lifeline to get hold of drowning men. But the most dangerous part of the work in which Leader Shepherd took part was going with messages for the coastguard officer and bringing supplies of rockets from the coastguard station. In doing this he had to make his way along the face of the cliff by a very, narrow and slippery ledge of rock which overhung the sea and was washed by the waves. He had to do this alone, with a gale blowing, and in the dark, when a false step or a slip meant death. But he did it, and did it several times. And that was how he proved his pluck. But another test of it was given when the German men of war bombarded Whitby. The Scouts had just got back when the shells came flying in bursting about the place. Instead of hiding away in the cellar, they at once ran back to the Coastguard Station to see if their services were needed. One Scout was hit and afterwards lost his leg, and the rest were described by the coastguard officer as so cool and brave that "the Germans might have been firing at them with peashooters for all that they cared." And Leader Shepherd was one of these, plucky and ready to do any duty that he might be called on to do, even under most unexpected and dangerous fire of heavy guns. Well, don't you think he did fine work and helped to bring honour to all Scouts?" 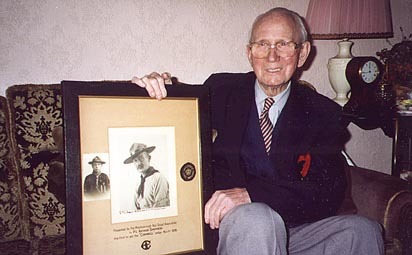 In 1962 Arthur retired from the ICI plant on Teesside and moved to Overton, Lancashire with wife Dorothy, for retirement and “sea air.” His scouting days were still not over with, aged over sixty-three, he became the Chairman of the 1st Overton (St Helen's) Group for a number of years until he and his wife moved to Bare in Morecambe where they had a bungalow. 16th Morecambe briefly entered into this story in 1993. The District Chairman had received a letter from Arthur's niece asking if a local Group would do a "good turn" by tending to the garden of the bungalow in Bare, as Arthur, now 94, had moved back to Middlesbrough. This we gladly agreed to do and that is when we became aware of this piece of scouting history. 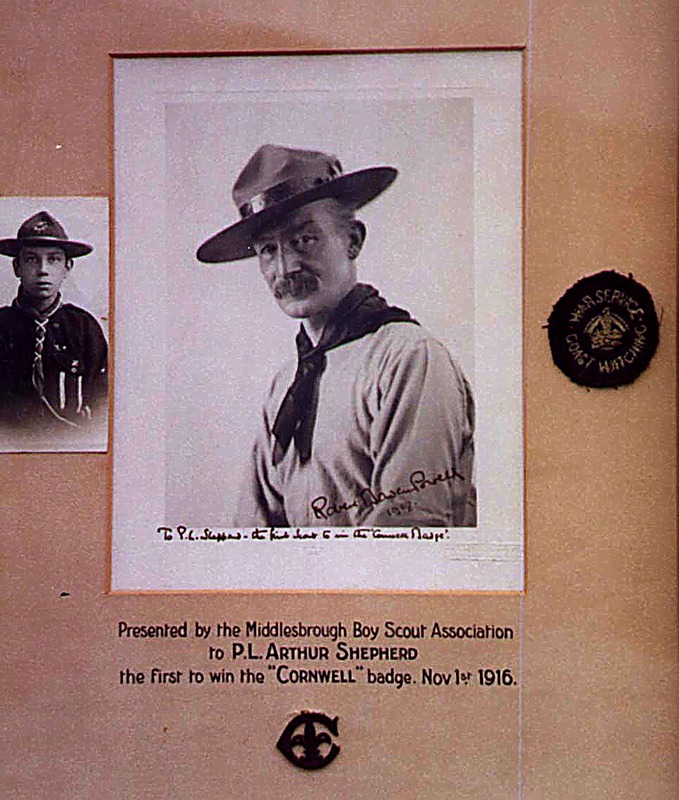 As a footnote, fascinated by this story, the writer of this report arranged to visit Arthur at his niece's home in 1994 where I was privileged to meet them both and to take some photographs of the first scout to receive the Cornwell Badge together with his badge and framed mementoes. A great honour. When asked of any memories of the Founder he commented that his language could be very rough at times, surprising perhaps, but then again perhaps not so from a soldier of many years campaigning. Arthur's niece told me on one occasion that one great ambition that Arthur confidently expressed from an early age was that he would live to be 100 and he almost made it. Having found this during one of my many internet browsing sessions, I was quite surprised. It has been yet another unique element to the Rohilla's story. The individual that had the opportunity to meet with Arthur and his niece was indeed fortunate, had I been aware of such a unique piece of history I would have liked to have met him for myself so that I could have shared my enthusiasm with the Rohilla. The origins of the Cornwell Badge are fully explained in a Scouting website which can be found using this link.